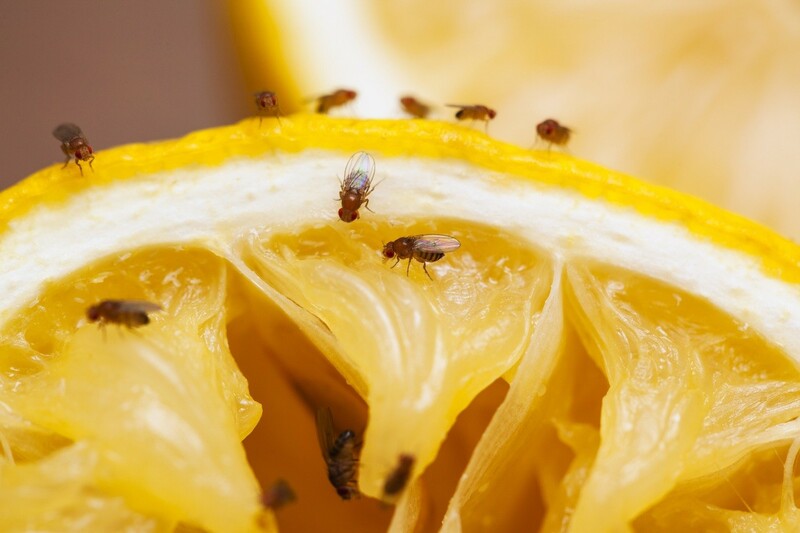 The fruit fly is one of the most common pests found in and around the home. Fruit flies get their name because they tend to fly around sweet food like fruit. Although fruit flies will thrive on just about anything organic, fruit flies have become a major pest in the home due to the increase of vegetable and fruit consumption. People are eating more vegetables and fruit and with this consumption comes the increase of fruit fly infestations. Fruit fly problems can develop overnight. The typical route of entry is via the grocery store. Fruit fly eggs are indiscreetly carried home on produce purchased at the grocery. Fruit fly eggs are already laid on the fruit or fruit fly adults simply hitch a ride on the foodstuff and emerge when unpacked. Developing fruit fly pupae are hard to see and typically go unnoticed. Within a few days they will start to hatch and the problem will quickly escalate. Once in your kitchen, fruit flies will find a ready supply of food. They’ll forage about trying to get established. Fruit flies love garbage disposals, garbage cans and fruit bowls. But they will be drawn to ketchup, tv screens, computer monitors, showers, tubs and even pets. Washing produce will help by removing fruit fly eggs and pupae but it’s hard to get 100% of the problem removed. And once they hatch, fruit flies will hover over the sink, garbage pails or fruit bowls searching for anything sweet to eat and on which to lay eggs. Fruit flies are small, about 1/8 of an inch, and have bright “red to orange” eyes which distinguishes them from other fly species. Fruit fly eggs will hatch in less than two days and young will eat and pupate in under 8 days. These stages are hard to see; they typically will hide and are quite small. Although most infestations don’t get huge, fruit flies will be persistent and aggravating pest if left unattended. The following video shows a closeup of two fruit flies where you can see their large red eyes. 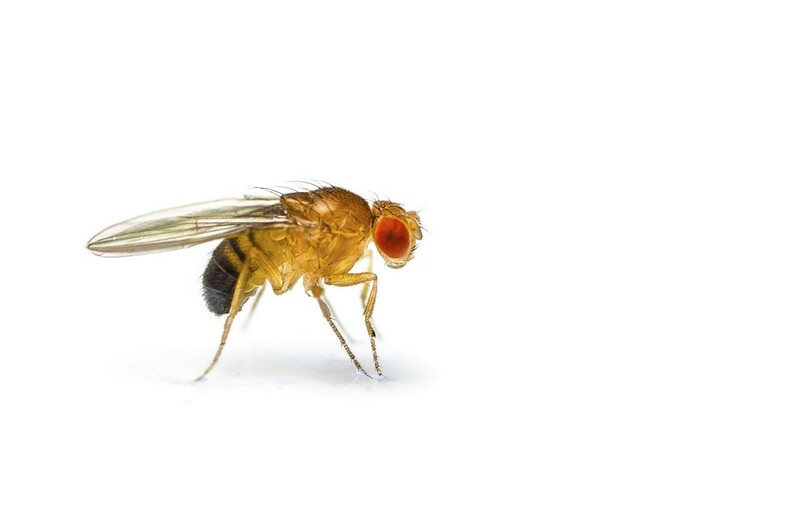 The best way to get fruit fly control is to first locate their food and where they’re focused. If you eliminate what they’re eating and breeding on, fruit fly control will be quicker and more complete. Once you remove their food source, the following treatment options will help control them in other areas where they may be nesting. For most people, killing the fruit flies that are flying around with a space spray seems like the best thing to do. Space sprays are products that can be applied to the air and are safe for kitchens and other open areas where fruit flies like to hang around. For these locations, products like PT-565 is a good option. It uses pyrethrin as the active ingredient and is both fast acting with very little having to be applied for quick results. 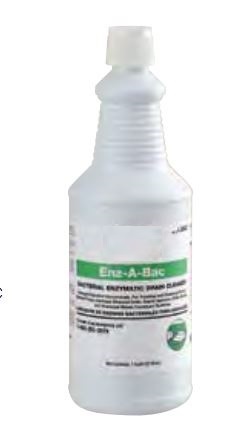 Treat by spraying for 5-10 seconds per room with activity. Expect to retreat daily for 1-2 weeks to break the cycle. This is needed since treatments won’t last but 15-30 minutes and that means hatching pupae will re-infest rooms within a day if you don’t stick to the routine. The organic choice is just a effective compared to the PT-565. 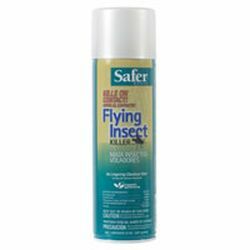 Known as FLYING INSECT KILLER it too will work quickly and will only require a little bit to be applied where you see activity. Both products can be used daily as needed but be prepared to use either for 1-2 weeks to break the local cycle.. The big problem with space sprays is they don’t last long. Once applied, their active will only kill adults and larvae for 30-60 minutes. After that, hatching pupae will live so if you don’t treat 1-2 a day for 2-3 weeks, the problem can persist. And if you miss just one room where they’re breeding, you’ll never get rid of them. WHAT IF THE FRUIT FLIES ARE COMING FROM THE SINK DRAIN? In fact fruit flies love sink drains. Sinkerators can harbor exactly what they need but in fact, the slime and grudge most any drain line can have will be enough to sustain a good population of drain flies. If you see them coming from the drain line or find them hanging around a sink, its highly likely this is their source for food and maybe even being used for egg laying. To take this area away from them, treat down the drain with SURVIVORS once a week. This product is nothing but an enzyme that will “eat” the grudge, slime and other organic matter they need to live. To treat, simply pour 3-4 oz down the drain once a week for 4 weeks. Next, spray down the drain with PT-CYKICK as needed. This should be done on any day when you don’t treat with Survivors and it can be done 2-3 times a week if needed. Cykick will kill developing stages and provide relief until the Survivors gets a chance to do its thing and take away their nests. For environments where fruit flies are a never ending problem, consider installing an AUTOMATIC AEROSOL MACHINE. These machines are small, around the size of a cigar box, and can be placed on a shelf or hung on the wall. They take just 2 “AA” batteries to power them for 8-12 months and once installed, will do the treatments for you. Basically they’re configured to release a quick 1 second “blast” of space spray every 15 minutes. By constantly releasing this spray, flying pests like fruit flies won’t stand a chance of living where machines are installed. Each machine can manage up to 400 sq/ft efficiently and they can be installed anywhere in the home, garage, etc. Inside the machine you’ll need to install a small can which contains the same pyrethrin based active like the PT-565. METERED INSECTICIDE is the more common option used and cans will last 30 days when the machine is set to go off every 15 minutes. It does have a slight odor and designed for use in garages, basements, barns and outside areas. One can will last 30 days and should will control any flying pest like flies, mosquitoes, moths, gnats, wasps and more..
For living areas like the kitchen or bathroom, go with CLEAR ZONE refills. This option is odorless and safe to use where food is prepared. Lastly, fruit flies can be caught with traps. These devices will help reduce activity and should be deployed where you see activity. The NATURAL CATCH FRUIT FLY TRAPS is discreet and small making it ideal for use on countertops. The FRUIT FLY GLASS TRAPS. is decorative and can be hung in kitchens, dining rooms, etc. and blend where the Natural Catch might otherwise be noticed. Both traps will help keep down adult populations throughout the warm season and in some cases, stave off an infestation by catching reproducing females before they have a chance to lay eggs. But once a problem is established, traps alone won’t get rid of them for good. 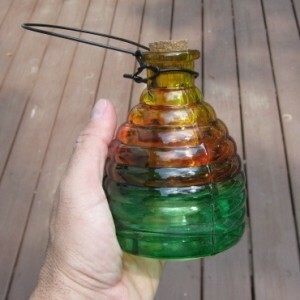 Another trap worth considering is the FLY WEB LIGHT TRAP. This device is small, plugs into the wall and works on a wide range of flying pests. If you’re unsure just what species of fly you have active, consider this trap a sure fix. It uses a small glue board to capture flying pests as they enter the capture area and will work on all kinds of flies, gnats, mosquitoes, no seeums and more. This video shows how easy it is to treat for fruit flies in the home using some of the products mentioned above. Fruit flies can be a persistent pest in the home. Though most common in the summer, they can persist throughout the winter if they find a location in the home on which to breed and nest. Treat with the Gentrol for long term control and keep some of the Fruitfly Traps out when adults are active. Use one of the space sprays to knock out persistent adults and you’ll be able to keep them under control.